Miranda Hart has made no secret of the fact that her pet pooch Peggy is one of her greatest loves in life - in fact, the comedian even penned a hilariously heart-warming book centred around her beloved dog in 2016. So it’s sure to have been a tricky few days for the former Call the Midwife star, as she’s revealed that poor Peggy has been a little under the weather recently. Taking to her Instagram, she shared with fans that her 11-year-old dog had recently been through a pretty tough operation. Miranda posted a picture of Peggy looking rather sad, with a cone around her head. In the caption, she explained to her followers what had happened. She wrote, ‘Post op chic. Rocking the cone. Not calling it the cone of shame. Calling it the Cone Overlord of Protection. ‘Thankfully all pretty much ok (bad foot/bone issue). Nothing keeps you in the present moment more than watching a dog in the present moment dealing with something they can’t possibly understand. Guru Peggy. #peggyandme #bestfriend #dogsofinstagram #coneoverlord’. Aww – poor Peggy! Fans of Miranda’s were quick to send their messages of support to her and her pet pup, wishing Peggy a speedy recovery from her operation. One wrote, ‘Best wishes for a speedy recovery for Sweet Peggy! ❤❤❤’, while another fan commented, ‘Get Well Soon Peggy big puppy hugs and kisses 😘 hope @realmirandahart is spoiling you rotten and waiting on you hand and paw 🐾’. And a third said, ‘Aww poor Peggy hope she gets better soon. 😻😭’. 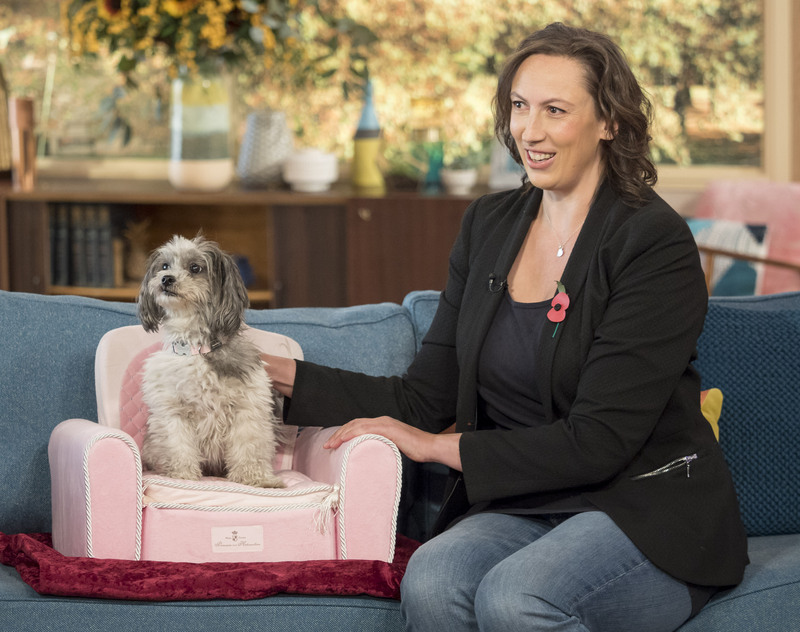 We’re sure that actor and writer Miranda is lavishing plenty of love and attention on her furry pal, who she often calls her ‘best friend’. In her book, Miranda told fans how Peggy had actually saved her, after suffering a bad break-up, and a tough bout of glandular fever. In an extract for the Daily Mail, Miranda wrote, ‘I had a little being who adored me, indeed who I think might just love me – approval from anyone else wasn’t necessary. ‘I found myself realising that it’s better to be single than to be in a relationship with someone who doesn’t give kind, loving and trusting approval.